Today, the long awaited Star Wars The Clone Wars "The Lost Missions" trailer was released via the Star Wars YouTube Channel. The video is embedded below. The 13 episode season will be available in the U.S. and Canada via Netflix on March 7, 2014. 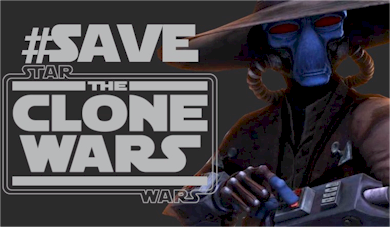 On the recent RebelForce Radio, 02/21/14, Jimmy Mac and Jason shared the idea of #CloneWarsLives to call them with voice mails thanking Disney for "The Lost Missions" at 708-302-1737. They will be sending the voice mails to Disney. We can also send letters and tweets to Disney to thank them for giving us these 13 episodes of a cancelled of a TV series, and while we're doing that, it would be a great time to also tell them that you want more episodes. Will we get these 13 episodes on bluray?